Cupcakes are undoubtedly the chic sweet treat of the day. Carefully decorated cakes can be used for birthdays, weddings, showers and any other cause for celebration. Save yourself some money by learning how to make these cupcake creations yourself. Contemporary Cakes is a boutique cake making business that specialises in celebration cakes. 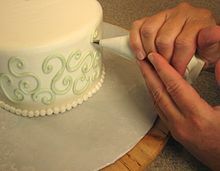 If you would like to learn how to turn batter and marzipan into a work of art, sign up for a hobbyist cake making class. These one and two day courses teach students how to bake and decorate baked goods. You will be taught by a qualified pastry chef with twenty-eight years experience in the industry. Class sizes are kept small (only four per class) to ensure that students receive the benefit of the teachers full attention. Participants need only bring themselves, as all equipment and materials are provided. Everything you make in class can be taken home; Contemporary Cakes will even provide you with a box for your cakes and cookies. The Contemporary Cakes classroom is located in Daisy Hills. Bookings for cake classes can be made by contacting owner and teacher Jackie Thompson on (07) 3388 2453 or by e-mailing Jackie@contemporarycakes.com. Where's the Best Vintage Store in Brisbane?